This is more of a pre-wedding ritual but is an important step that leads to the main event! Once the couple informs their parents about their decision, the parents sit down to discuss the prospect. 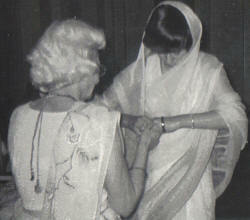 Once the wedding is finalized, Rupia Peravanu is performed to mark the official coming together of the two families. 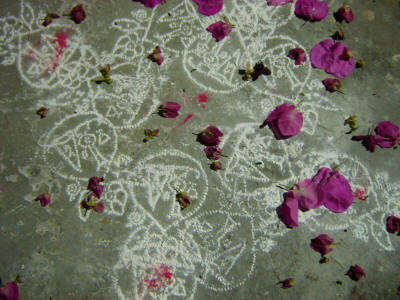 It may be considered as a modern day engagement and is carried out at the bride-to-be’s home. The groom’s side visit the home of the would-be bride and bless the bride with silver coins (hence the word Rupia) in a brocaded bag. 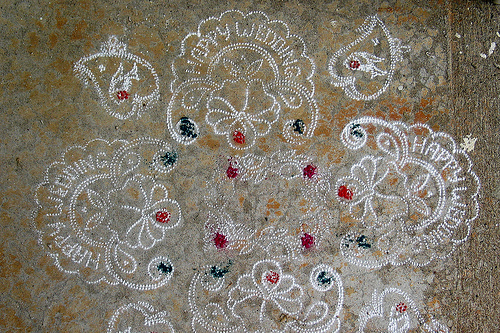 The home is decorated with chalk designs and garlands (made of flowers of knitted with wool) and it is generally the women who engage in this ceremony. Well, there you go! You can finally feast on those gorgeous dishes you have been eyeing throughout the ceremony. 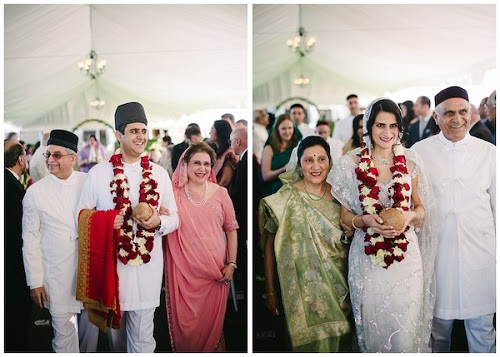 The Parsi’s know how to party and can surely give you a run for your money when it comes to celebration and food. Dance, music and food are the main ingredients for the wedding reception. Remember Farah Khan and Boman Irani in Shirin Frahad ki Toh Nikal Padi? 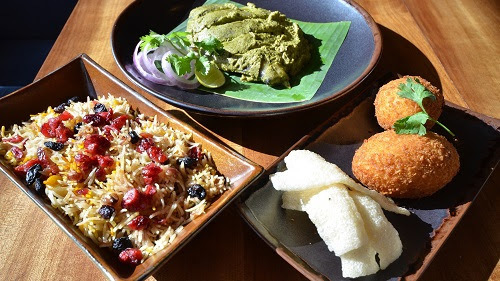 The Parsi wedding food feast usually comprises ofsaariyas (fried sago chips), raspberry drink, Chicken Sali, patri-ni-machchi (fish steamed in banana leaf), muttonpulao dal, kulfi, custard and other delicacies. The original Pazand Ashirwad was published in Gujarati with its word by word translation in Gujarati by that eminent Parsi Scholar Ervad Feroze Masani. Ervad Soli P. Dastur transliterated it as well as translated it from Gujarati into English. By Ervad Soli P. Dastur. After our ancestors received the gracious asylum by King Jadi Rana and his court, and after establishing our Pak Iranshah Atash Behram on the land granted to us by King Jadi Rana, our learned Dasturjis, at the request of the King Jadi Rana, explained the basics of our religion and social customs to the King and his court. 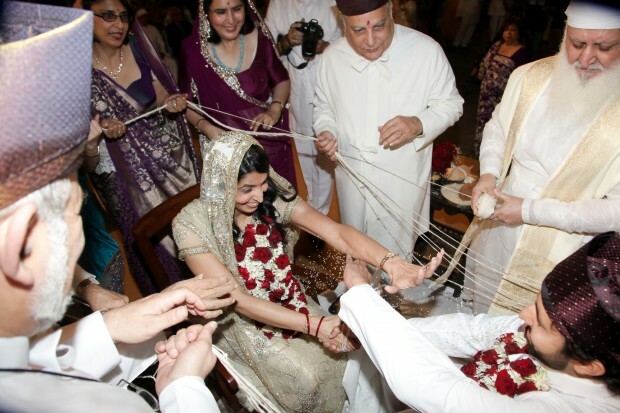 One of our most sacred social custom of marriage was explained to them with our Pazand Ashirwad. And in their honor, our Dasturjis translated this Pazand Ashirwad in Sanskrit and presented it to the King and His court with a solemn oath that in their honor, during our most sacred marriage ceremony, we will perform our Pazand Ashirwad followed by this Sanskrit Ashirwad, followed by Afrin Buzorgaan and Doa Tandoorasti. Over the centuries, unfortunately, many Mobed families dropped this Sanskrit Ashirwad from the marriage ceremony. However, to this day, some of the nine Sanjana families in charge of Iranshah still continue this old tradition and I am very proud to say that our immediate Dastoor family still has kept this old custom going and my brother Ervad Palanji Dastoor and me have performed a few Ashirwads of our immediate families with both Pazand and Sanskrit Ashirwads. Hope we continue this practice in the future. 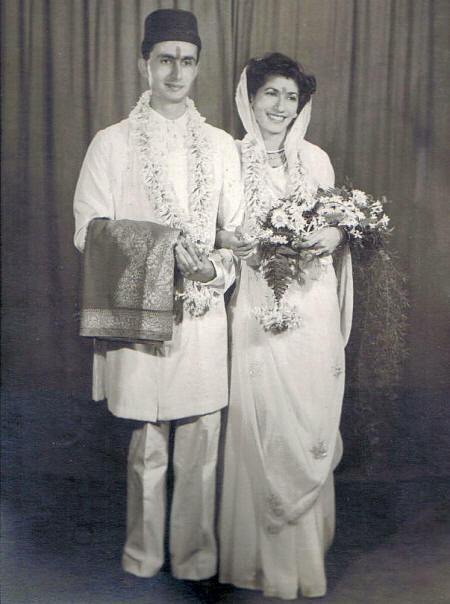 British Deputy High Commissioner, Mumbai invited to a Parsi wedding for the first time, and gives a ‘thumb-nail’ review of the community’s current situation. 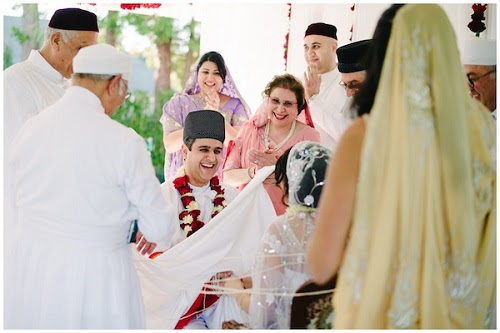 I was fortunate recently to attend my first ever Parsi wedding. Two of the 40 or so Parsi staff in the Deputy High Commission in Mumbai, Nazneen (our press officer) and Burzin ( a member of the UKBA team), were getting married, and they had been kind enough to invite my wife and me to their wedding. There are many contrasts with a typical UK wedding. 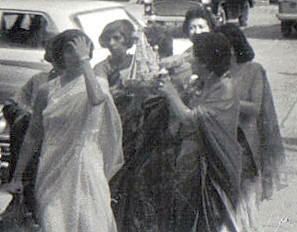 First there were far more people – about 700 – than most people in the UK would normally invite but Indian festive occasions extend beyond the immediate family and friends of the couple to include the social and business obligations of parents and siblings on both sides. The couple are married on a dais after which all the guests go up to meet and greet them individually.” Then there is food, and lots of it! The food is served on a large banana leaf – I had never realised, until I saw mine covered with delicious fish, chicken, rice and much more, how big a banana leaf is! Afterwards, and perhaps this is the biggest difference with Britain, most of the guests depart without so much as one speech: something many people might welcome in the UK. 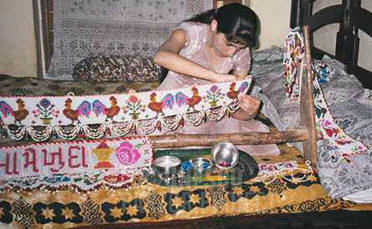 The Parsis have kept these traditions, and many more, ever since they first emigrated to India from Iran centuries ago. During the wedding the couple went to a nearby “Fire Temple” to pray. These are so named because a fire burns in them eternally as it represents purity, being the only element that cannot be contaminated. In continuance to the original vow made when they first sought refuge in India, Fire Temples admit only Parsis. Pheroza Godrej, who edited a superb book on the origins and development of Bombay, has produced a magnificently illustrated History of the Parsis. I can’t claim to have read it, but it is a labour of love and meticulous research, which wowed some recent visitors from Europe at her home. The Parsis have a wholly disproportionate influence in Mumbai and India compared to their tiny population. Globally there are probably no more than 120,000, with the largest group outside Mumbai in Toronto. The Parsi influence was underlined shortly after the wedding I attended by an announcement by the Tata Group – India’s largest business conglomerate, and of course with major interests in the UK, including JLR and Corus – that they were appointing as their next chair a Parsi, Cyrus Mistry. Tata was founded by a Parsi, Jamshyd Tata, who was brought up in the small, dusty trading town of Navsari on the Gujarat coast. He started a steel business in Eastern India, and from there his successors as Chairmen– Parsis all – have built the company into the $78bn megalith it is today. There are other powerful business groups in India with Parsi owners, including the massive consumer and industrial goods manufacturer Godrej, and smaller companies like Pune-based Forbes Marshall and Thermax. But the Parsi influence goes way beyond business. Tata have some of the most well-endowed Foundations and Institutes in India, and a significant proportion of the Group’s profits are ploughed under its constitution into these charitable organisations. 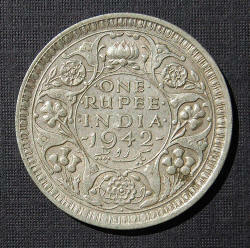 It is no exaggeration to say that many of Mumbai’s most valuable research organisations, hospitals and cultural centres (for example the vibrant National Centre for the Performing Arts, run by a Parsi, Khushroo Suntook, formerly a senior Tata executive) could not survive without Tata, Godrej or other Parsi generosity. So from a banana leaf feast to the next head of global giant Tata the Parsi influence continues to hold great sway in Mumbai. 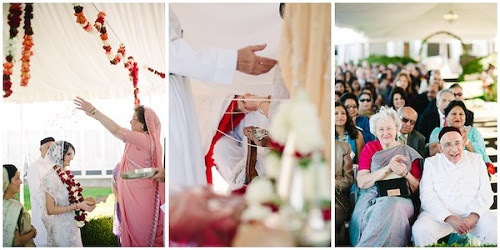 Varovar can be done anytime after the wedding, depending on both the parties. It can be done the next day, next week or next month. Only after the varovar is done you may pick up the Madavsoro –no-pot and empty out all the Ses of Paan, sopari, coconut rice, kankoo etc. and it should be put in the Sea or running water. A small vase/vessel/ that has been brought by the Bride should be decorated with teeli and garland put in 5-7 pedas (sweet meat), Paan, karek, sopari, badam, sakar. On the top put the red cloth (approx.1/2 to 1 mt.) from which small dress can be stitched on the 6th day after the first child has been born. Put coconut balanced on the red cloth Pointing upwards Garland the vase. And do sagan to them both and give the vase and an envelope to them both. If it is decided earlier some people may even return the ring to the Groom that was previously gifted as Sala Dakhal ni ring.